What a thriller! ARob sets the all-time TCU assist record, Bane clears 1,000 career points and we got to see TCU legends Josh Doctson, Josh Boyce, and Derrick Kindred in the stellar new threads. Oh…and a buzzer beater win. 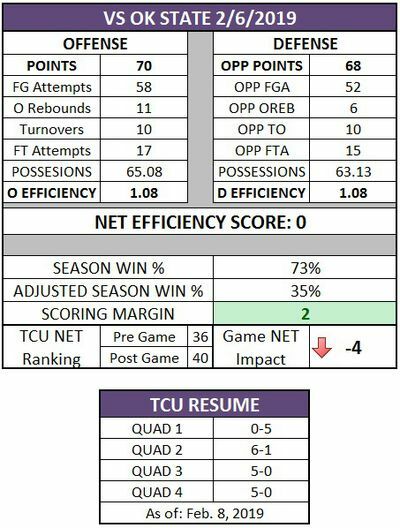 Obviously the computers and statistics did not much care for any of that or for TCU’s performance Wednesday, punishing the Frogs for the close home game against a lower-rated opponent. This just highlights how bad losing that game would have been for the overall resume; surviving with the win saved the season with a brutal gauntlet down the stretch. That gauntlet kicks off with a showdown in Ames as the Frogs will have to fend off Hilton Magic and the #13 ISU Cyclones. TCU is barely hanging on to a Top 40 spot and a win here would provide a much needed energy boost for the Frog resume. The Cyclones are one of only 7 teams to rank in the top 20 of KenPom Offensive & Defensive Efficiency (along with Duke, Virginia, UNC, Michigan State, VA Tech, and Kentucky), and are especially deadly at home, with their only loss coming by one point to K-State. This game will be a massive challenge for the Horned Frogs, but presents yet another opportunity to get a signature road win that could be held up against all other Bubble threats. · #49 Syracuse (↓7) vs #28 Florida St. (↑3) – The Seminoles went to the Carrier Dome and put a smackdown on the Orange to jump back into the Top 30 and now host #14 Louisville this weekend for a chance to really fly up the rankings. ‘Cuse better bounce back this weekend against #135 BC to avoid a massive losing streak as their next 4 opponents have an average NET rank of #15. · #39 St. John’s (↑6) – The Red Storm have been on quite the roller coaster over the last few weeks, and their outlook was grim with a long road trip at Creighton, at Duke, and at Marquette. St. John’s took 2 of those 3 (losing at Duke) to jump back into the Top 40 and into a more secure Bubble position. Their stock could plummet again if #85 Providence goes into the Garden and steals a win this weekend. · #47 Indiana (↓4) – The Hoosiers couldn’t lock up a 2nd big upset win in a row and suffered the consequences. 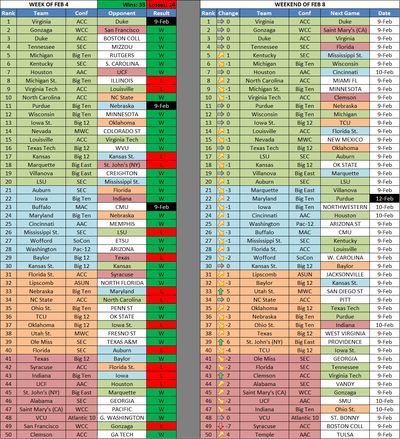 A close loss to #23 Iowa is no great sin, but now at 10 losses and with a very difficult remaining February schedule (average NET rank of #27 for their next 5 opponents), it is hard to see Indiana getting to 20 wins. With all those Q1 opportunities, they could still build enough resume clout to remain in the Top 50 and be in the Bubble discussion. · #52 San Francisco (↓3) – It’s hard to even call this a Bubble busting result – yes losing by 30 is not ideal, but when that loss is against Gonzaga in Spokane, it’s hard to get too bent out of shape. This does eliminate any margin for error for the Dons – with 4 WCC losses already, USF needs to win out in the regular season to earn an at-large bid. Losing to any team other than Gonzaga in the conference tournament would also likely end any Cinderella dream for the Dons. Could Morgantown Host a Baseball Regional?